There are numerous ways in which owning a family business can be beneficial to you as an individual, not least financially, if you know how to make the most of the opportunities it offers. One of these involves building up your credit record. By moving money between your own account and those of your business, and by taking out credit in a business capacity, you can build up a good reputation with lenders. You can also help the younger members of your family to make a good start with their credit histories, making it much easier for them to operate independently within the financial world. Although you may have spent many years building up a good personal credit record, being in business is a different thing - you may be surprised to find that lending organisations are still hesitant about dealing with you in a business capacity. Your family business will have to build up a credit history of its own. Fortunately, because businesses routinely deal with larger sums of money, this doesn't usually take as long, and in the meantime you can use your personal credit to arrange business borrowing by guaranteeing small credit undertakings such as utility bills for premises outside your family home. As your personal credit helps your business to develop a good reputation, you can in turn use your business to improve your own credit. When you own a business with bank accounts separate from your own, you effectively have control over two sets of finances. This is a situation which you can use to your advantage. The simplest way to do this is to keep your money moving. For simple finance checks your bank is less interested in how much money you've got and more interested in how big your income is. If you make small loans to your business and pay them back to yourself as director's remuneration (which won't attract tax), you'll look as if your income is higher and your bank will be willing to extend options like overdraft allowances. However, it's worth noting that if you're in the early stages of running your business and you're receiving state benefits to keep you going until you can earn more, the DSS will treat director's remuneration as income, even though it's just your own money moving around, and will subtract money from your benefits accordingly. Because it won't contribute to credit reports, and because it can incur legal risks, you should never borrow personal funds from your business, even though doing so could save you money. In the long term, it's better to borrow from an established credit agency. For young people trying to build up credit for the first time, working within a family business can provide a great boost. It's an opportunity to develop both business and personal credit to build a good credit reputation for use in later life. However, banks may be wary about lending money to someone who has no prior credit experience. In this case, the simplest solution is for a family member with a good credit record to agree to co-sign the credit agreement, which means that they'll pay back the debt if the young person can't. If the young person takes out credit through the business, this will happen automatically (in that the business itself will be liable), and the young person's business credit record will assume that same status as that of the business itself. If the business is established and doing well, this can be a great asset. The danger of getting somebody else to co-sign when you take out credit is that if, unknown to you, they have a bad credit record, their bad credit will be transferred to you - even if you pay your bills on time - and this can make it difficult for you to get credit for years (though you can approach credit reference agencies to try and get it sorted out). 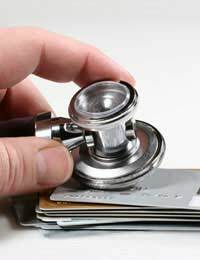 In business terms, this means that it's possible for a guarantor with bad credit to damage the business' credit reputation, and for bad business credit to damage personal credit records. Where bad credit is involved, it's vital to keep records separate and avoid joint financial ventures. Balancing credit concerns can be tricky, but it's simple once you've established what you're doing, and it can enable you and your family to take full personal advantage of your success in the business sector.